"Our version of the West Coast Style IPA first brewed in collaboration with Amager Brewery in Denmark. Brewed with one malt, Golden Promise from the UK, with Citra and Mosaic hops. If you think Todd is a good brewer, you should hear him play his axe (guitar)! Named by Amager’s marketing director Henrik Papsø." Last October I reviewed the Amager version of Todd the Axe Man which was a collaboration between (as you might guess) Amager and Surly Brewing. 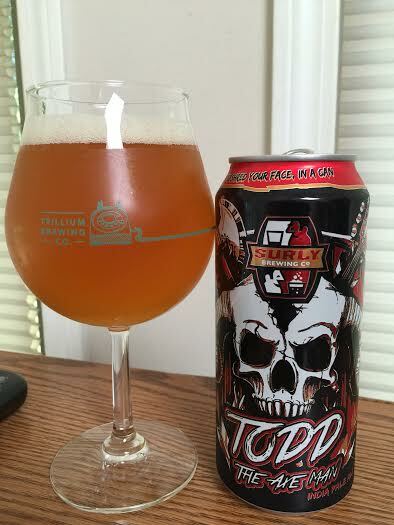 Surly is well-known in the midwest for some great hoppy IPA's and this one is no exception according to many beer geeks out there. It's always fun when breweries collaborate and then brew the same beer at their respective breweries. The results is never the exact same beer made. I recall enjoying the Amager version, but based on everything I heard about the Surly version, I knew I had to try it some day. Luckily, that "someday" came in the form of an extra that was thrown into one of my trades. So thank you to Todd for hooking me up with this one. Pours a hazy, slightly dark, but glowing orange color with two fingers of white head the disappeared quickly. The aroma is a little toned down with some elements or orange and grassy hops. In addition to that there is some spicy black pepper and some cedar. Yeah, it's not off-putting, but just plain. Ok, maybe not "plain", but definitely clean-smelling. The taste packs more flavor than the aroma. The citra hops are shining brightly with tons of pulp-free orange juice and no acidity. It's also very peach-forward with a little bit of mango. Hop bitterness contributes equally and has minor touches of dankness, but the overall hop flavor here is actually minty and piney. The first half is basically all juice and then it's a walk through a row of spruce trees for the post halftime festivities. The finish has a tiny kick of the aforementioned black pepper from the aroma. Mouthfeel is a little undercarbonated and mostly calm. The body is medium and full for the 7.2% abv which also has no trace of alcohol. That hop bitterness sticks to the tongue for a few seconds after each swallow. Compared to the Amager version, Surly's release showcases the Citra hops better and leads to an overall juicier IPA. As I drank this, I continued to think how flavorful this actually was. The bitterness helped add some complexity to the fruity hops and the 16oz can was gone in no time. To the best of my knowledge, this was the 2nd release of Todd the Axe Man (don't quote me), but this seems worthy enough to make on a consistent basis and shouldn't be held off as a sporadic release.